On a Tuesday afternoon in late May, a group of nine students was quietly whisked past tables full of researchers studying rare and valuable texts through magnifying glasses. They were led into a secure area rarely seen by visitors. As they walked through the rooms, they passed parchment volumes dating as far back as the eighth century and were surrounded by historical Catholic Church documents that featured the handwriting of popes, kings, and queens. They were deep inside the Vatican Secret Archives. 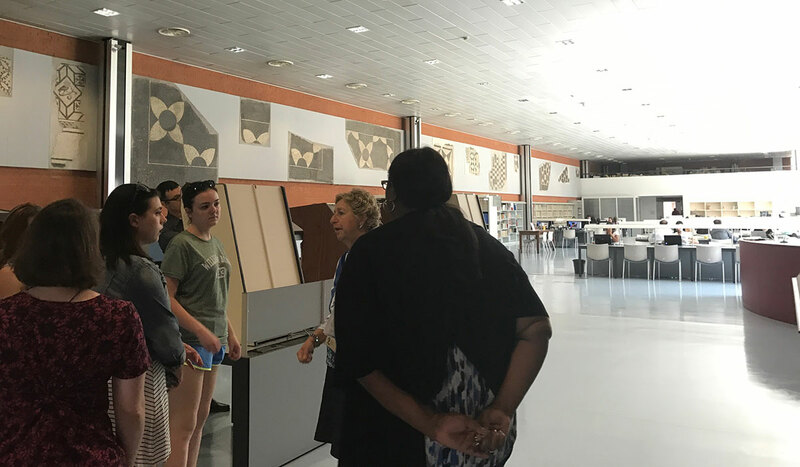 The visit to the archives was a rare opportunity for these students on their second full day in Italy. 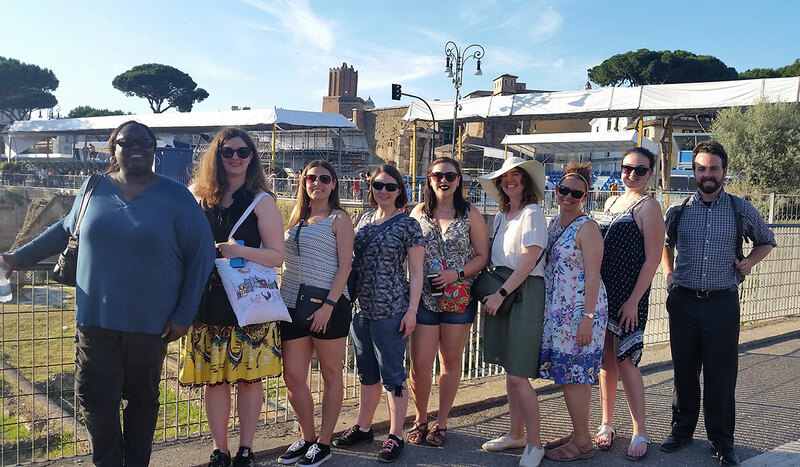 The students spent two weeks abroad for Visions of Italy, a graduate course offered by Catholic University’s Department of Library and Information Science in partnership with CUAbroad. 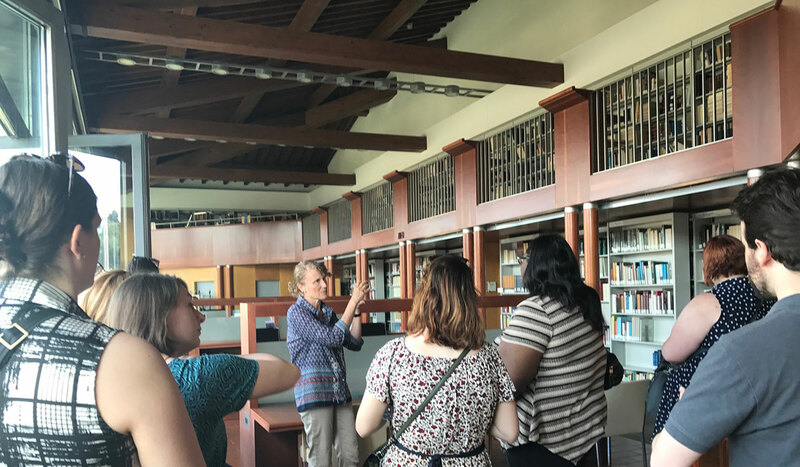 The course, which is offered every other summer, was led by Renate Chancellor, associate professor of library and information science. 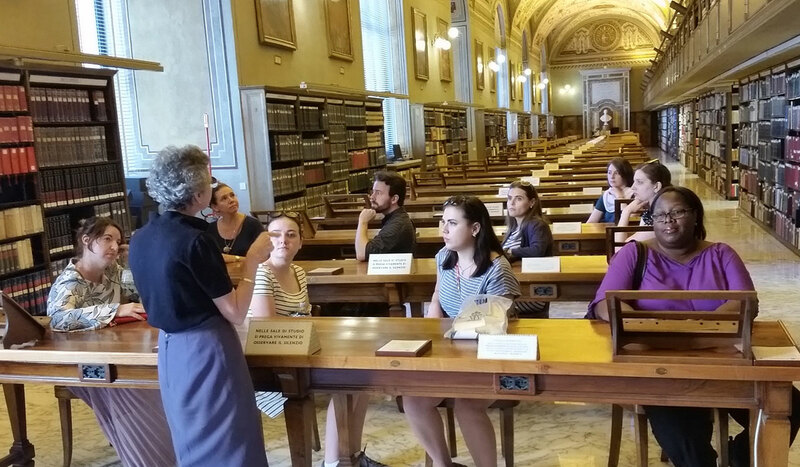 “I wanted to provide students with the opportunity that no other library and information science program in the country could offer — to visit and have a behind-the-scenes look at religious and cultural objects from the Vatican Library, the Vatican Archives, and other prominent libraries and archives in the cities of Rome and Florence,” Chancellor says. The unique opportunity attracted not only students from the Department of Library and Information Science, but also a doctoral student from the Department of Semitic and Egyptian Languages and Literatures, an undergraduate student, and four library and information science students from other colleges and universities. Founded by a papal charter, Catholic University has a special tie to Rome and the Vatican. This connection enables the University to provide students access to locations like the Vatican Secret Archives and Vatican Library, places few other people ever get the chance to see. 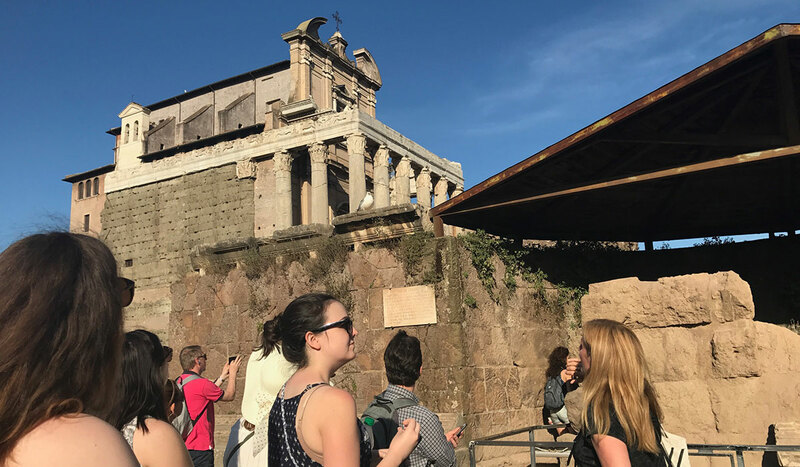 Students in the course stayed at the University’s Rome Center in Trastevere, a short bus ride away from Vatican City and close to many of the other sites students visited during their time in Rome. 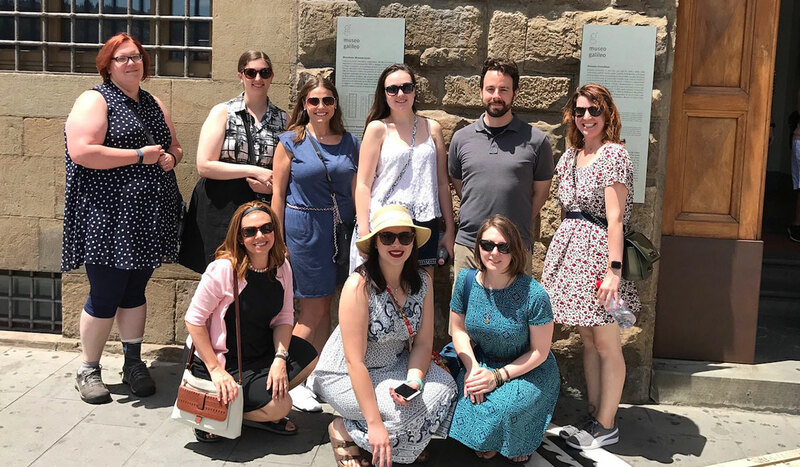 For two days, students also explored Florence, with behind-the-scenes visits to places like the Uffizi Gallery and Medici Chapels. Traveling in a small group enabled the students to develop a quick bond. Chancellor and the students often took time to discuss what they had learned and seen over leisurely lunches and dinners. 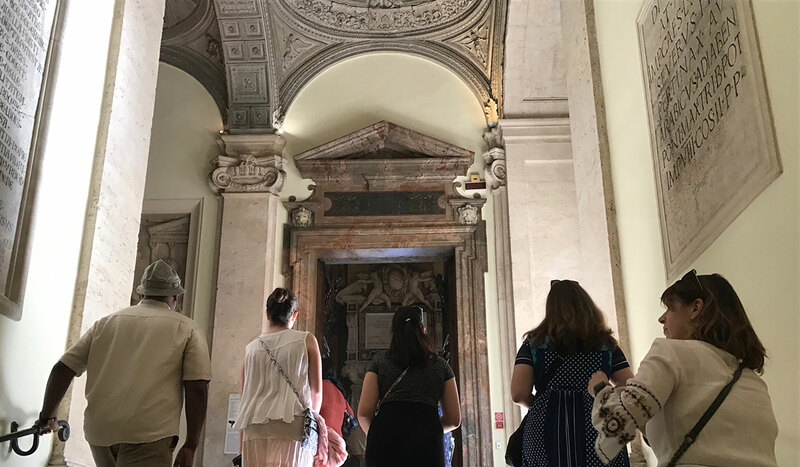 Alaina Furman, a library and information science student at Catholic University, was excited to immerse herself in the culture and history of Italy. By the end of the trip, she was able to communicate easily with locals in Italian. Furman’s favorite visits included a tour of St. Peter’s Basilica — led by Rome Center Director David Dawson Vasquez — and the Roman Forum, which featured a discussion with an American professor of antiquities, who vividly described life in ancient Rome as the sun started to set on the ruins of ancient temples, monuments, basilicas, and government buildings behind her. 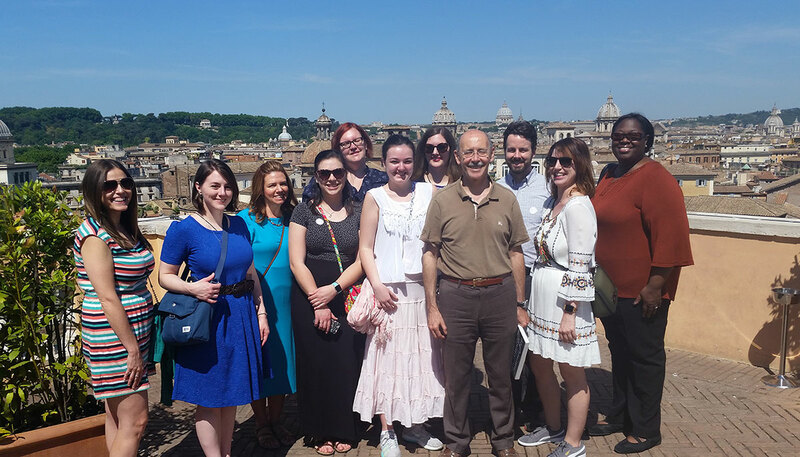 In addition to the Visions of Italy course, the Department of Library and Information Science offers students numerous opportunities to network and immerse themselves in libraries, archives, and museums in the Washington, D.C., area. The department’s signature curriculum is the Cultural Heritage Information Management (CHIM) track. Courses in this track often include site visits to places like the Smithsonian, Library of Congress, National Archives, and other cultural and historical sites in the area. Some classes are offered regularly at the Library of Congress. Students in other tracks also benefit from the school’s location in Washington, D.C. Students pursuing law librarianship can take advantage of visits and practicum opportunities at places like the U.S. Supreme Court and the Department of Justice. A large network of engaged alumni in the area provides students the chance to connect with professionals working in the institutions in which they are interested. The department regularly facilitates these networking and mentorship opportunities. For example, this fall, the department will host a mentoring session with the Federal Library and Information Network (FEDLINK). Student organizations within the department also enable students to take on positions of leadership in the field. Visit the Department of Library and Information Science’s website for more information.